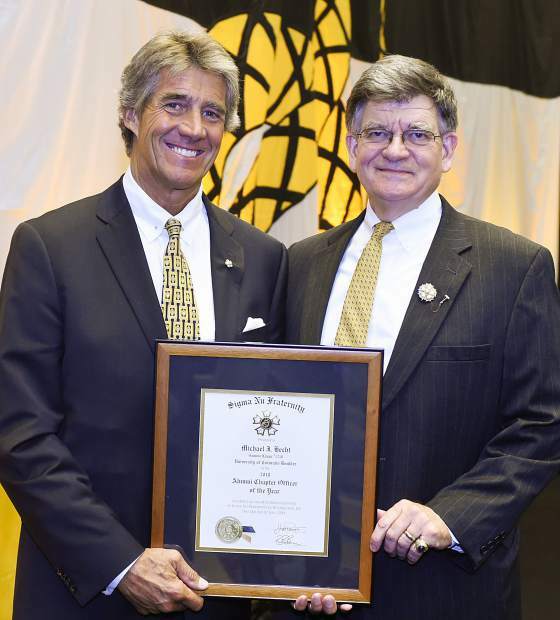 ichael Hecht has been named Sigma Nu Fraternity Alumni Chapter Officer of the Year. VAIL — Michael Hecht has been named Sigma Nu Fraternity Alumni Chapter Officer of the Year. To win the award, an officer must be active in the alumni chapter and the general fraternity, demonstrate leadership, involvement, and overall achievement. Hecht has served Colorado’s Gamma Kappa Chapter in numerous capacities beginning with two terms as commander of the chapter as a collegian. His volunteer service includes more than 20 years as house corporation president, four years as alumni advisory board chairman, and as a leader in the alumni chapter since 2016, where he helped recruit younger alumni to serve as board members, planned annual events reconnecting alumni to the chapter, and created an alumni mentor program for collegiate members. Hecht was instrumental in forming the CU Interfraternity Council in 2005 as a self-governing organization. Over the past 12 years the IFC has grown from 600 to more than 1,600 members. Sigma Nu Fraternity was founded in 1869 at Virginia Military Institute in Lexington, and has 165 chapters and colonies, and has initiated more than 245,000 members since it was founded.